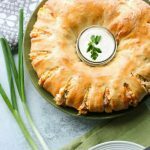 Savory Monkey Bread - Dessert Now, Dinner Later! 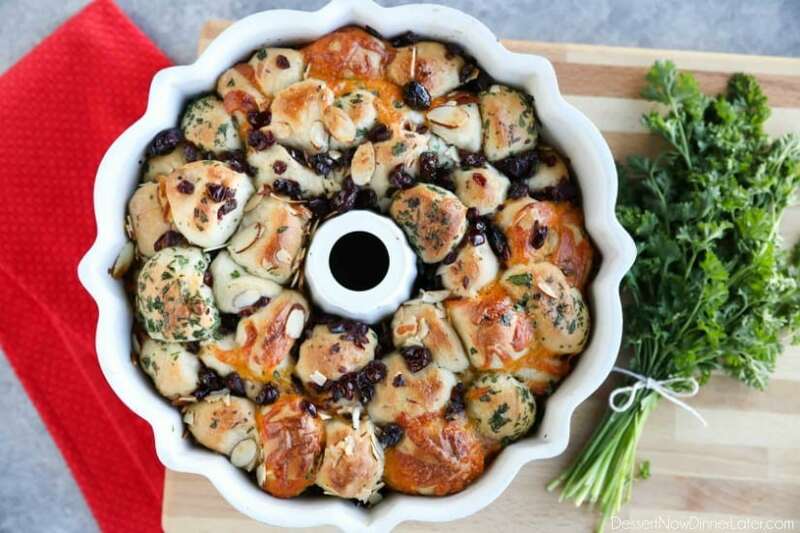 Savory Monkey Bread makes a great appetizer to share. Eat it as-is, or dip it in oil and vinegar. 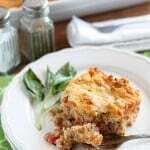 It’s a delicious savory side to your dinner! I’ve been thinking about the holidays and how everyone makes and shares sugary treats for their neighbors, but it kind of gets overwhelming. There’s only so much sugar coma you can handle, right? 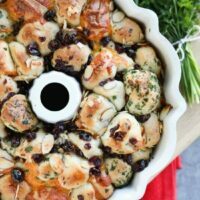 So I thought, it would be nice to make something salty to counteract the sugar overload, and I decided on this savory monkey bread. A restaurant I used to work at had a Ranch Monkey Bread they would serve for any meal you ordered. Kind of like the chips and salsa at a Mexican restaurant. It was SO good and easy to make, but I thought a few more toppings would be fun to try. 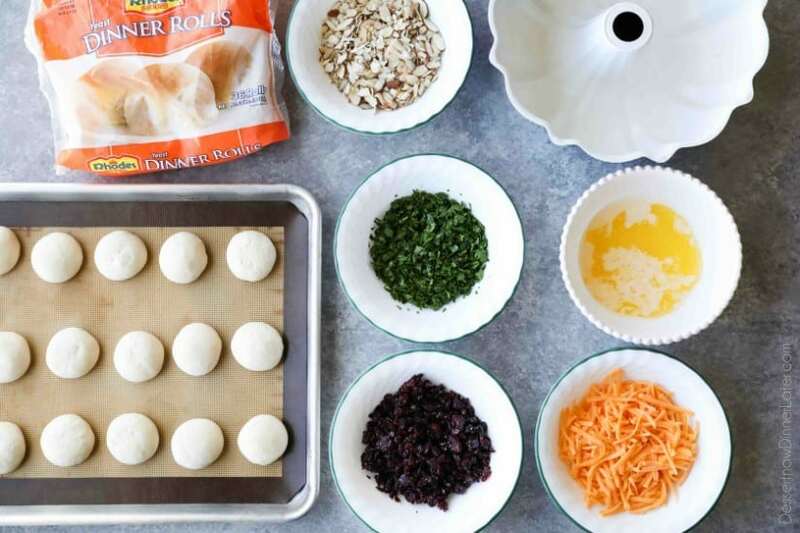 Of course to make things easy, I started with my favorite frozen dough – Rhodes White Dinner Rolls. Legit yeast bread! 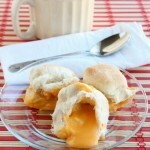 (Not canned biscuit dough.) Cut the rolls into fourths for the perfect sized bites. 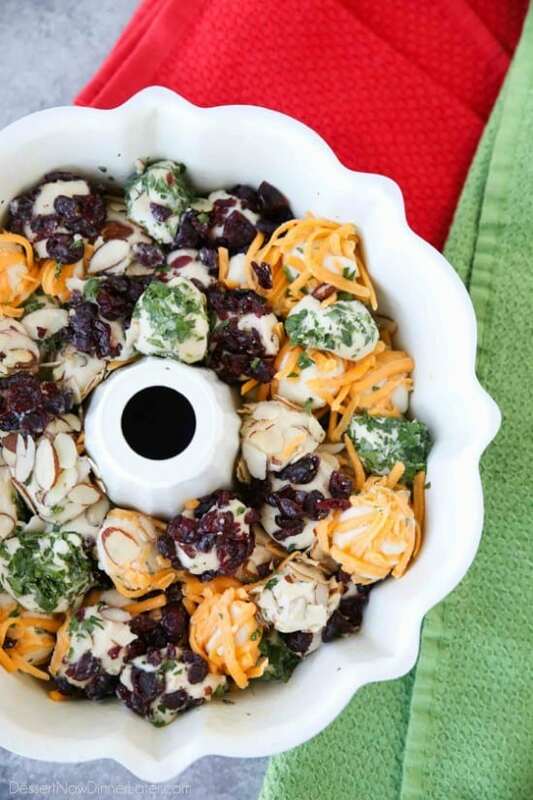 Then I dipped the cut pieces of dough in a salty garlic butter and coated them with sliced almonds, chopped parsley, dried cranberries (with cracked black pepper), or cheddar cheese, layering them randomly in a pan. Let it rise for 30 minutes and bake it until golden brown. 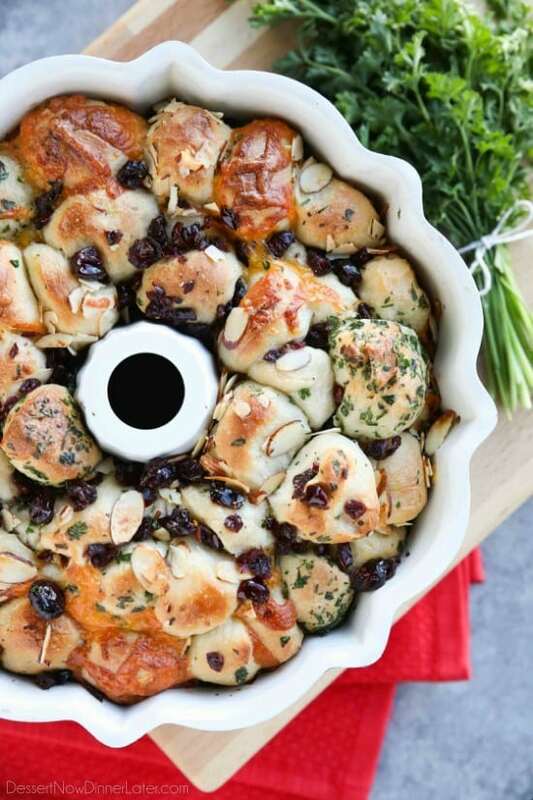 I was originally hoping this savory monkey bread would look more like a Christmas loaf with the green parsley, red dried cranberries, and nuts, because it’s not the holidays without some nuts. But after it baked, the colors weren’t as vibrant as they were pre-oven. It still tasted delicious though. My husband practically ate the whole thing himself. I’m a dipper, so I like to put some olive oil and balsamic vinegar on a plate to soak my bread in, but it’s totally optional. You can definitely feel free to customize the toppings as well. It’s very versatile. Enjoy! 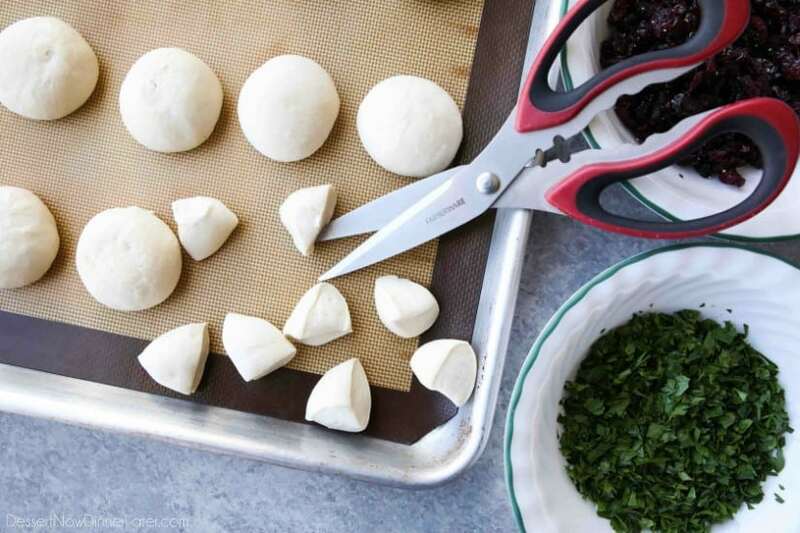 Cut rolls into fourths with kitchen shears. Melt butter in the microwave, about 30-45 seconds. Add the minced garlic and salt. Stir well. Prepare toppings in separate bowls. Dip each piece of dough into the butter, and then coat with a single topping. Layer coated dough pieces in a heavily greased bundt pan. 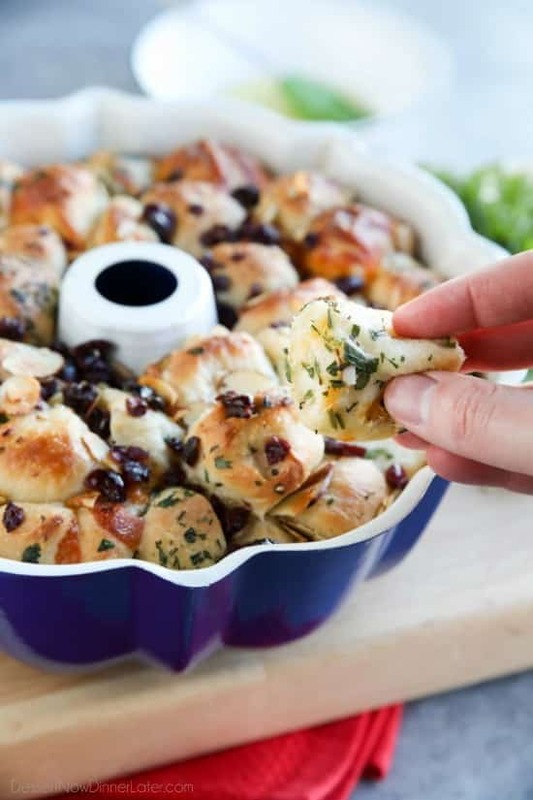 (Grease the bundt pan with cooking spray or butter.) Cover the bundt pan with sprayed plastic wrap and let rise for 30 minutes. Bake at 350 degrees for 25 to 35 minutes or until golden brown, and dough is baked where pieces touch together. Delicious warm. 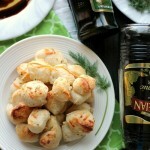 Optional: Serve with olive oil and balsamic vinegar for dipping. Store leftovers in a zip-top bag or airtight container.